Manoa resident Judy Wilson, middle, raised a Barack Obama banner at the Hawaii for Obama campaign yesterday at Kawananakoa Middle School in Nuuanu. 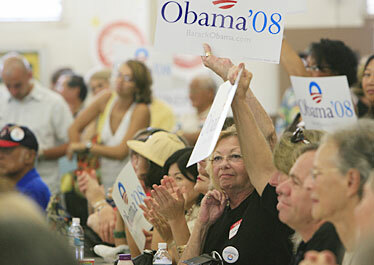 The campaign provided information to supporters on the get-out-the-vote effort for the upcoming Hawaii caucuses. Ordinarily, Chicago resident Patricia Jones Blessman and her husband would simply be in Hawaii on vacation at this time of year. But in the throes of a presidential campaign, and her candidate Barack Obama in the thick of the race, the vacation plans have been put on hold. "During these six weeks, we're going to be campaigning," Blessman said of her and her husband's time in Hawaii this year. Jones Blessman was among the throng that turned out yesterday at Kawananakoa Middle School in Nuuanu for what was billed as an organizing event for the Obama campaign in Hawaii. Organizers had expected about 200 people. While there was no official count, many in attendance noted that the size of the crowd was larger than a similar event held last summer, well before Obama's victory in the Iowa caucus and second-place finish in the New Hampshire primary. That event had about 150 people. "It's the same level of excitement, but there's a lot more people," said Rob Muschany, 42, of Kailua. "I think people are figuring out that he really does have a very legitimate chance of being the Democratic nominee for president." David Fry, a campaign volunteer for the past month, said local support grew significantly after Iowa. "Prior to (Iowa), we did have a lot of folks who were telling us it just couldn't be done, and they'd give a lot of different explanations for why they thought that was," said Fry, 32, a legislative aide. "We're getting a lot more people coming in who would've supported him, but thought he didn't have a chance," he added. "Now we're getting those folks to come over and they're recognizing he does have a chance." Supporters at the rally heard from Maya Soetoro-Ng, Obama's half-sister, who lives in Hawaii, and U.S. Rep. Neil Abercrombie. Both had campaigned on the mainland leading up to Iowa and New Hampshire. While her brother would love to visit Hawaii at the moment, "unfortunately, now, there are no plans at this time," Soetoro-Ng said. "He's got to work incredibly hard, particularly in the weeks leading up to Feb. 5, and I think he'll reassess and see what can be done (after that)," she added. Feb. 5 is Super Tuesday, when 22 states hold primaries or caucus votes. Hawaii's Democratic caucus is Feb. 19, and Abercrombie, for one, expects the vote to matter. "Suppose they're split down the middle" after Super Tuesday, Abercrombie said. "That means every single caucus after that -- Hawaii, Wisconsin, whatever ones come after -- can be very, very important." Abercrombie was leaving yesterday for Nevada, which holds its caucuses Saturday. The campaign has said it hopes to tap into the large number of Hawaii transplants in Nevada, particularly in Las Vegas. Soetoro-Ng, a teacher at La Pietra-Hawaii School for Girls, said she will be unable to campaign on the mainland, but she is keeping in touch regularly with her brother. "He recognizes that we have a long way to go in this campaign," she said.